I have a new man in my life. If you know me, you know this happens less often than a solar eclipse. My house is full of flowers (thank you, new man!) and my head is full 'man meals' I can cook him. This steak sandwich went over pretty well. 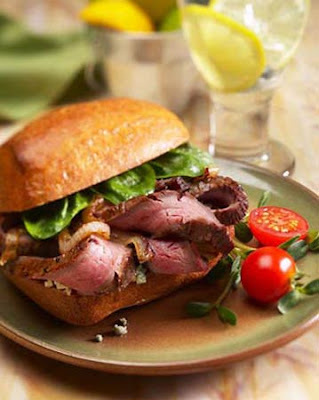 Man Meal - Steak Sandwich 4 - 6 oz. steak per sandwich (I use New York Strip Steak or Filet Mignon if I'm feeling fancy and rich) Blue Cheese, 1 tsp. per sandwich 1/4 onion, thinly sliced 1/4 cup baby arugula leaves Dijon Mustard Extra virgin olive oil 1 french baguette Kosher salt & pepper 1. Pat steaks dry with paper towel season both sides with salt and pepper. Heat oil over medium heat in a skillet. Brown the steak on all sides for 1 minute each. Please steaks in a preheated oven at 500 degrees for about 15 minutes or until desired 'doneness.' Remove steaks for oven, set on cutting board and tent loosely with foil for 10 minutes before cutting. (this lets all the juices settle down, so the steak will be juicy and tender.) 2. In same skillet used to brown the steak, saute sliced onions with a little salt, until completely soft. Set aside. 3. Cut baguette in half lengthwise. Toast in oven for 3 minutes. 4. Spread a little dijon mustard on the bottom of bread, and top with caramelized onions. Arrange sliced steak on top, and sprinkle blue cheese on top to melt. Place a few arugula leaves on top, and finish off with the top piece of bread.